“If I never dive again, I’ll be happy!” Those were the words that I screamed out to Nick, the instructor, as I exited the water after my first dive at Osprey Reef. Laying in the Coral Sea, 75 miles beyond the Great Barrier Reef, Osprey Reef is a magical place. At DiveBuzz, we have dived Osprey previously, and have long held the view that it is world class. Keen to check our theory, I was itching to get back to this remote region. The theory was substantiated, this place IS world class, the sort of place that inspires passion. 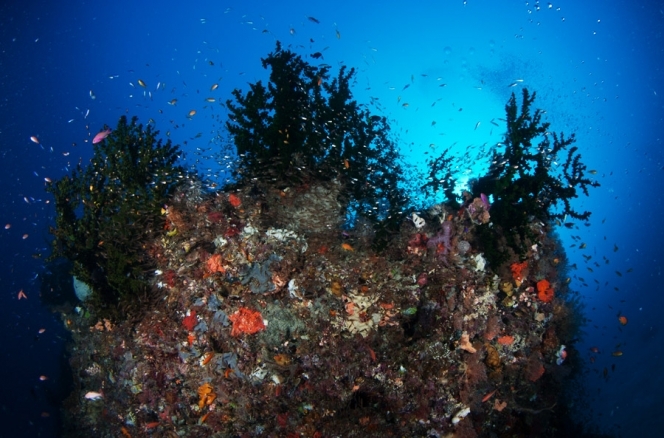 The sort of place that will lure you back time and time again, to get your fix, to get your DiveBuzz. If you ever lose your diving mojo, a trip on Mike Ball will be sure to provide the medicine you need. 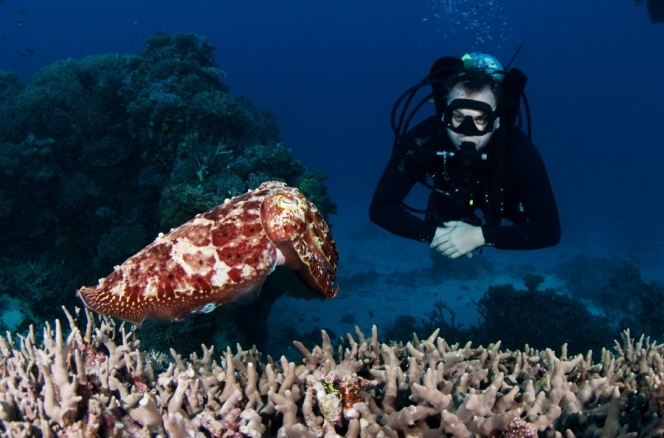 Osprey Reef offers truly spectacular diving. 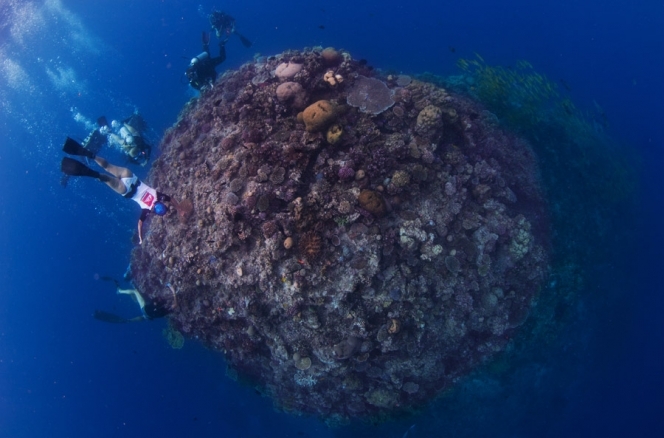 A submerged, almost oval shaped atoll, measuring 12km by 25km in length and covering roughly 195 square kms with breathtaking walls that plummet to 1000m and beyond. 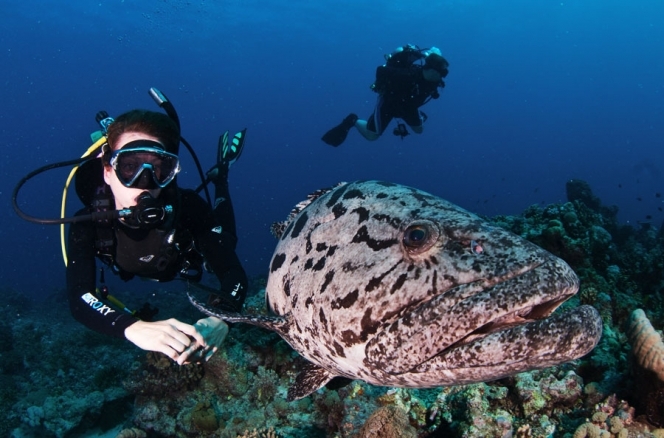 With this in mind, I booked the 4-night Fly Dive Coral Sea trip that combines the world famous Cod Hole and Ribbon Reefs and the world class Osprey Reef. At DiveBuzz, we fully research the best diving and select the best operators that are best suited to our needs. We landed on Mike Ball and we were certainly not disappointed. Since 1969, Mike Ball Dive Expeditions has built an unparalleled reputation within the dive industry. Reputations are built on consistently delivering a quality product and four decades on, DiveBuzz was keen to see for ourselves what all the fuss was about! 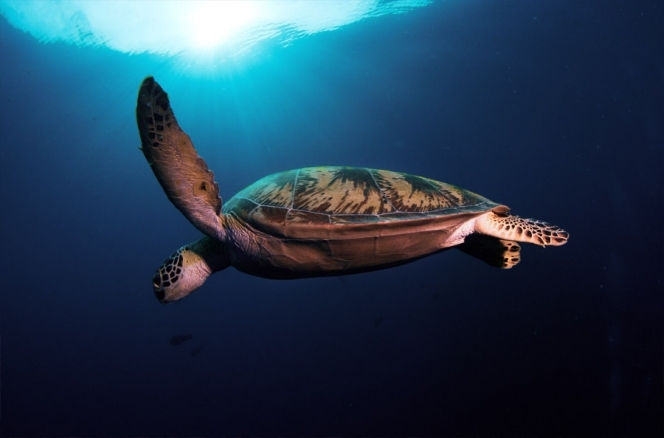 From the very first touch point with Mike Ball Dive Expeditions, it was clear to see why this organisation had earned a world-renowned reputation. The 40 years of industry knowledge and experience have certainly made this a well-oiled machine and, from the very first enquiry to the after trip service, it shows. After checking in at the air-conditioned offices in the heart of tropical Cairns earlier in the day, we were met by two friendly dive crew, who ushered us down to Spoilsport, our home for the next few days. This purpose built, twin hulled beauty, oozes class, and, above all, is built to withstand and be stable in the high seas that the trip to remote Osprey Reef throws at it. On boarding, we were greeted by the friendly crew and volunteers in the spacious saloon with a champagne, cheese and fruit reception. A quick introduction to the crew and passengers was followed by a boat briefing and, the all important, safety briefing by “Pirate Pete” the skipper. We were soon on our way out of the glorious Trinity Inlet, surrounded by blue skies and sunshine, leaving behind the tropical, lush mountains of Cairns and seaward bound. Settling in to the long overnight trip north, Nick, the Trip Director (TD), meets with each diver individually to assess level and buddy pairs. This is where the Mike Ball experience really comes into play over other operators DiveBuzz have experienced. The Mike Ball way allows divers as much freedom as possible, within the realms of their experience and their safety. With this in mind, as an experienced diver who was travelling on my own, I was advised that I would be able to buddy up with another experienced diver on the boat (Adrian, a Tech diver from Norway), buddy up with the dive crew volunteers or have a solo dive assessment or even a solo course and go it alone. I jumped at the opportunity of going solo and immediately signed up for the solo course, which would give me the appropriate skills and qualification to be a self-sufficient diver in the future. [Read more on the SDI Solo Diving course here] Shortly afterwards, I was escorted down to the spacious and immaculate dive deck to meet my new buddy (a pony bottle!) and set up my gear. A quick overview from Julia, my solo instructor who doubles as the boat’s photo pro, a couple of beers and reading a 100 page solo diving manual and that was me for the night! Wake up time is a respectable 6.45am. I am up and about at 5.30am, too excited to wait any longer. We have a cooked breakfast of bacon and eggs and a dive safety briefing from the TD and away we go. We are at the world famous Cod Hole, located on the Ribbon Reefs near the stunning Lizard Island. Conditions are spectacular, bright blue skies and glassed out, gin clear waters. Julia assesses me on this first check out dive as a self-sufficient diver. We free descend and then I need to demonstrate that I can hover motionlessly for 3 minutes, turn on my pony bottle and switch to breathing from it, prior to switching back to my main gas supply and switching the pony off and perform a mask remove and replace. Then it’s a big wave to Julia and I’m on my own! I spend the next 60 minutes getting used to being solo and getting acquainted with the giant Potato Cod that make this dive site famous. Mike Ball no longer feed the cod, but despite this, these magnificent creatures that are bigger than me are very interested in me! At the end of the dive I need to deploy my surface marker buoy (SMB) for my solo course and also snorkel around the boat several times. Another dive at Cod Hole is followed by a move to Snake Pitt, a site famous for its curious Olive Sea Snakes and pristine coral. The conditions are picture perfect, 5 knots of wind, zero current and crew murmurs that Manta Rays have been spotted here recently. I descend in solo bliss and, within 3 minutes, as I spot a giant Manta in the distance, my camera jams! I make my way over to a large pinnacle that the TD has briefed us on, known to be a Manta cleaning station and he is back! I spend the next 20 minutes fixated on this beauty – he is HUGE! A solid dive briefing on Mantas by Nick means that, gladly, no divers are chasing and we hover motionlessly watching the Manta circle time and time again. He is oblivious to us air breathing, bubble making monsters! After 20 minutes, I drop onto a wall, where visibility dropped significantly to an almost shocking 30m! 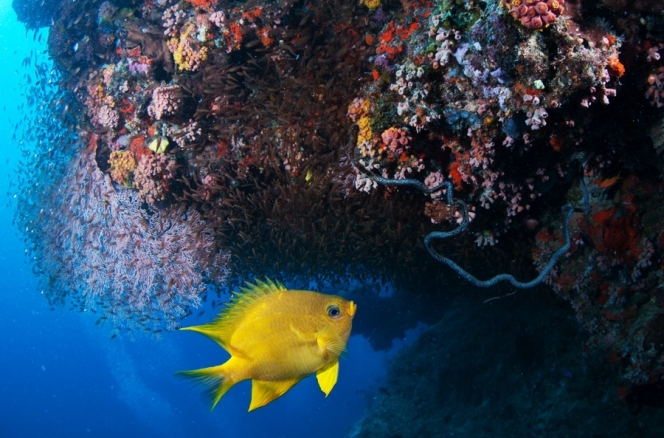 The coral is healthy and vibrant and humming with life. Everyone climbs back onboard with a DiveBuzz! Now, back to diver freedom. On certain days, Mike Ball offers an open dive deck, meaning that you can fit as many dives into your day as you wish. At DiveBuzz, we are always keen to cram in as much diving as possible so I completed four long dives before dinner. Others enjoy a more relaxed pace and spend more time sunning themselves on the spacious sun deck. No matter how many dives I do, the efficient crew always ensure that my numbered dive deck towel has been spin dried and folded for my return from the water. It’s these little things that make the difference. Whenever I exit the water, a friendly crew member is waiting for me to take my camera, unclip my fins and log me back onto the boat. After the first day, the crew know which is my camera and have it ready for me every time I jump in. This is no mean feat given there are over 20 cameras on the dive deck! With ample space for cameras, air hoses to dry off camera equipment, a full re-breather service and safety features galore really make this trip stand out. An Italian dinner (no wine yet) is followed by my fifth and final solo dive of the day – a magnificent night dive at Snake Pitt, followed by Tiramisu dessert and a few wines and I’m done for the day! We commence our overnight journey out to the remote Osprey Reef. I wake up on day 2 early again, excited about being back at Osprey Reef. I switch my tank over from Nitrox to air for a deep dive with Adrian, the Tech diver and my new buddy. Mike Ball sensibly has a solo depth limit of 30m. Adrian and myself, who have completed in excess of 3000 dives between us and we planned to go a little deeper. Again, this is where the Mike Ball diver freedom kicked in for us and we were allowed to dive to 50m (Max depth for experienced divers on Mike Ball. See note below) on the magical Osprey Reef walls. Mike Ball depth guidelines allows dives in excess of 40m to a maximum of 50m to divers with moderate experience to same depths. We are at a site called Fairy Grotto and the conditions are even better than yesterday. I simply could not have asked for more. We descend straight down the wall to see the spectacular giant Gorgonian Sea Fans. The blackness below is all consuming as the wall plummets down to 1000m and my narcosis kicks in*. 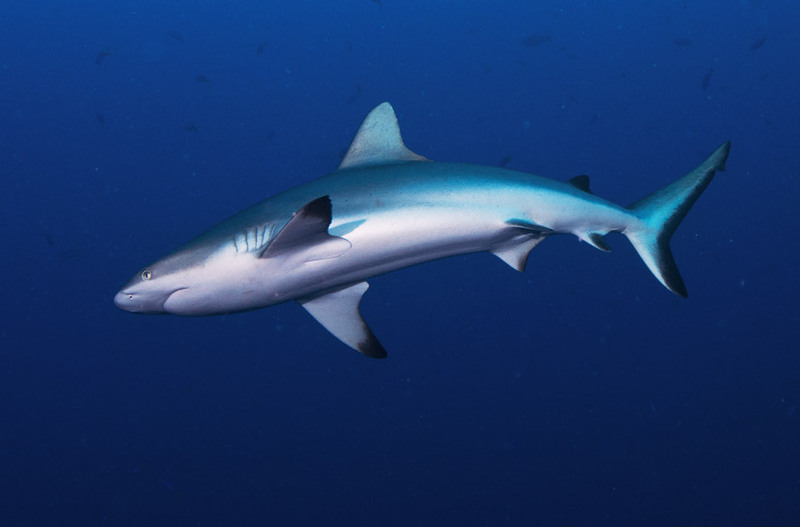 In the periphery, countless Grey Reef sharks cruise the wall – this is shark heaven, this is truly mind blowing, this is amazing, this is 100m visibility, this is Osprey Reef, this IS WORLD CLASS. If I never dive again. I’ll be happy with this final experience! 60 minutes of sheer, all consuming, breathtaking pleasure. Two more spectacular solo dives at Admiralty Anchor with its stunning cave and great macro life before we head to North Horn for the famous shark dive experience. As an experienced diver, always first to be ready, I descend to the shark feeding natural amphitheatre with the crew as they set up for the dive. The sharks know exactly what is going on and countless Grey Reef sharks, Whitetips and a formidable looking 3m Silvertip are starting to circle. I secure my spot on the wall as the rest of the divers are ushered into position. The feed itself is another well oiled machine, with the dive crew ensuring a spectacular yet safe experience in what can only be described as a 10 minute feeding frenzy. As the dive crew signal the end of the feed, and divers start to head back to the boat, the next 30 minutes, for me, is the best experience. I tag along with Julia the photo pro and we have some superb close encounters with a couple of very bullish Silvertips. Over 60 minutes of adrenalin fuelled shark action and an experience not to be missed. A solo twilight dive along the North Horn wall with feeding coral polyps, hydroids, superb colourful fans, cruising sharks and countless crustaceans ends a spectacular day of diving. We close our day with another great meal, several wines and a sing along with Pirate Pete, the multi-talented guitar playing, singing skipper. Day 3 and I cannot believe that this is my last day already. I wake up early again and we are now at a site called Around The Bend (also known as Raging Horn). I have dived this site previously and it is one of those special sites which can only be dived in near perfect conditions. Adrian and I decide to do another 50m dive and are tender dropped to a mooring to descend down off the wall. Another spectacular wall dive with 100m visibility and cruising sharks, followed by a very relaxed exploration of the shallow lagoon. Three more dives that day at Halfway and the stunning False Entrance completes my last diving of the trip… Or is it? With perfect conditions like this and world class diving, I enquire about the possibility of staying on for the southbound trip rather than flying home the next day. Shortly later, I get the go ahead that there is space for me and I start to get excited again about the next 3 days! That evening, we have a spectacular sunset BBQ cooked on the deck with kangaroo, prawns, steak, chicken, sausages and all the trimmings. The vibe is party time, with Pirate Pete in full swing again on the guitar and the group having fully bonded with no more airs and graces! I wake up the next day to another glorious day. Glassed out conditions, blue skies and the magnificent Lizard Island in the backdrop. After a light breakfast, we are tender dropped onto the island for a guided scenic walk with Julia. We spend the next hour soaking in the scenery of this magnificent location, as the old guests depart and new ones arrive via the air strip on the island. Back onboard, we meet the new guests, and enjoy some cheese and crackers and relax while the new guests get briefed and set up. We head back to the Ribbon Reefs and Cod Hole for a dive and I spend a very relaxing 80 minutes in the shallows, photographing sweetlips and soaking up the atmosphere. Just three dives today, with the next two at Challenger Bay. I enjoy long solo dives in the afternoon and evening with garden eels, grey reef sharks, octopus, lots of gobies in the sand and a real feeling of freedom. We enjoy yummy food at Asian night and are entertained by more sing–a-longs with Pirate Pete and his trusty guitar and some impromptu pole dancing by Angelo, one of the Italian guests. Like the Mike Ball trip, Angelo’s pole dancing is very slick and we all get the impression that this is not his first time! The next day we move to Pixie Wall for our early morning dive. I jump in with Julia to try and find the leafy scorpionfish and am rewarded with my patience as we spot both a pink and a white one. Cuttlefish, nudibranchs and much, much more lay in wait for me. Another day with an open dive deck mean that I can get 5 dives in today. We are lucky enough to visit Vertical Gardens, a spectacular site that is rarely accessible as it is around the wild side of the reef. As the name suggests, this site has near vertical walls, which are simply stunning in these perfect conditions. I complete two dives at Vertical Gardens followed by a delightful Mexican inspired lunch prior to heading to Pixie Pinnacle. Pixie Pinnacle and Steve’s Bommie are iconic, world-class pinnacles and, after visiting both, it is not hard to see why. Both Pixie Pinnacle and Steve’s Bommie pulsate with life and present to the eye what many associate with the World Heritage Listed Great Barrier Reef. 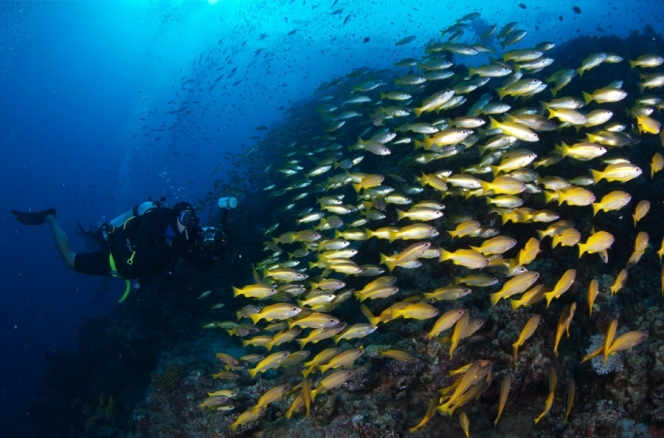 At Pixie Pinnacle, thousands of glassfish cling onto the bommie where colourful anthias gather on mass. The open deck policy means that you can also avoid the crowds on this dive, being solo at the end of the dive surrounded by all this pulsating life is simply stunning. I jump in for what proves to be the best night dive of the trip, at Pixie Pinnacle, this time with Michelle, a dive crew volunteer. We spend 15 minutes with a friendly green sea turtle watching him devour a jellyfish, find a resting wobbegong shark (rare in these parts), playful olive sea snakes swim between our regulator hoses, lionfish on patrol and a curtain of glassfish. Showered and changed from my night dive, we are treated to a gourmet dinner, a-la-carte (not buffet) style. I choose the chicken breast and risotto over the very popular, red emperor fish – it feels wrong to eat what has given me so much pleasure over the past few days! I am not disappointed. We are poured wine with our meal and feel very spoilt by the Spoilsport crew! This is not your average dive trip, this is the Mike Ball experience. On our last day I complete two breathtaking dives at the magical Steve’s Bommie. Hundred’s of anthias cover the top of the pinnacle, where many varieties of anemone fish have made their home. 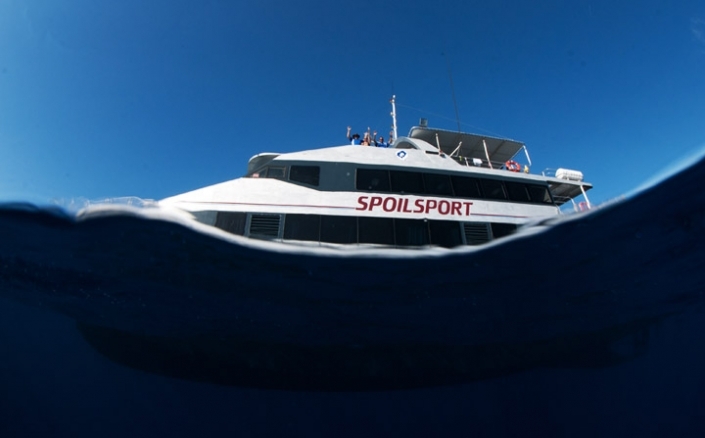 A little deeper, huge schools of blue-lined snapper and yellow goatfish complete laps of the pinnacle, whilst bigeye trevelly, barracuda and grey reef sharks patrol further off the pinnacle. Steve’s Bommie was followed by two dives at Flare Point prior to enjoying our final evening of eating, drinking, photo competition and the trip DVD viewing, as we head south for our arrival back into beautiful Cairns the following morning. In total, I completed 26 dives over six days, ate heaps of freshly prepared fantastic food, met some great people, experienced great service and had the freedom to explore the fantastic Osprey Reef plus the best that the Great Barrier Reef has to offer. Mike Ball is a truly slick operation with professional, hard working crew, impeccable safety, a great boat, and top notch diving. Reputation is built on consistent delivery of such service and experience and Mike Ball Dive Expeditions well deserves it’s reputation. So what are you waiting for, dive in for a truly unique world class experience with Mike Ball. Get the buzz, get the Mike Ball DiveBuzz! Nitrogen narcosis ...it's a state of mind!